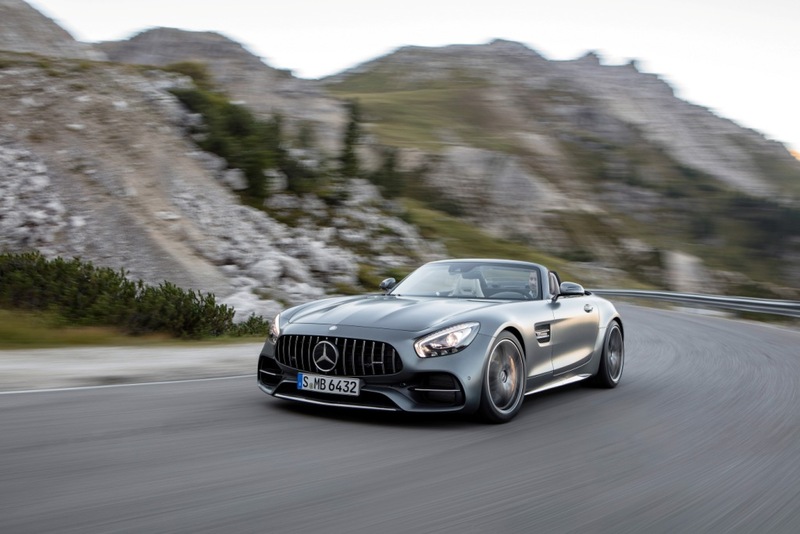 The GT range features a 4.0-litre biturbo V8 engine; in the GT Roadster this generates 476 hp, while the GT C Roadster adds an additional 81 hp (557 hp). The GT Roadster can sprint from 0 to 62 mph in 4.0 seconds, while in the GT C Roadster it takes just 3.7 seconds. The GT Roadster emits 219 g/km of CO2 and delivers up to 30.1 mpg on the combined cycle, meanwhile the GT C Roadster emits 259 g/km and can achieve 24.8 mpg. Both roadsters come with a three-layer fabric roof available in one of three colours (black, beige or dark red) at no extra cost. The roof opens or closes electrically in around eleven seconds, and can be operated at speeds of up to 31 mph. 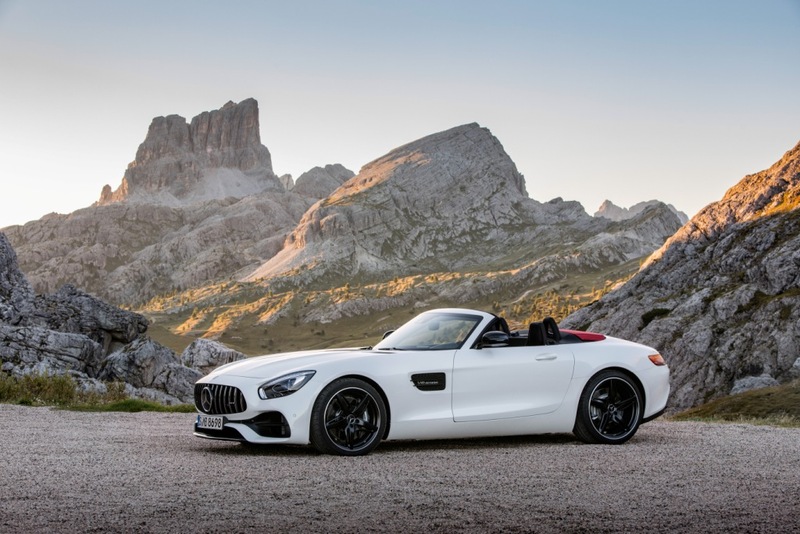 The GT Roadster comes as standard with 19-inch alloy wheels; AMG Panamericana grille; wind deflector; AMG performance exhaust system; heated AMG sports seats with Airscarf; and black Nappa leather upholstery. 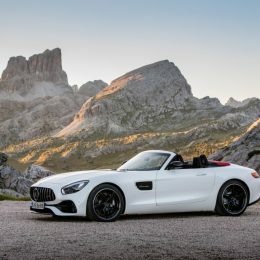 The GT C Roadster has 19/20-inch alloy wheels (front/back); Burmester surround sound; Parktronic with reversing camera; AMG sports seats with Airscarf; Keyless-Go package; Active Air Control system (flaps in the lower front bumper adjust according to the vehicle speed – thus increasing high-speed stability and reducing drag); AMG Panamericana grille; AMG performance steering wheel finished in Nappa leather and Dinamica microfibre; and red brake calipers with ‘AMG’ lettering. The Premium equipment line costs £4,195 (standard on GT C Roadster), and includes Keyless-Go package; Mirror package; door sill panels in brushed stainless steel with ‘AMG’ lettering; Burmester surround sound system; Parktronic with reversing camera. At the top of the GT range, the AMG GT R Coupé generates 585 hp and 700 Nm and can travel from 0 to 62 mph in 3.6 seconds. It emits 259 g/km of CO2 and delivers a combined fuel economy of 24.8 mpg. 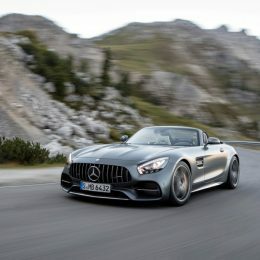 The GT R comes as standard with AMG sports bucket seats; carbon fibre roof; AMG Panamericana grille; AMG GT R bodystyling; yellow brake calipers; AMG performance exhaust system; static rear aerofoil; AMG sports bucket seats; 19/20-inch alloy wheels (front/back); Parktronic, AMG Interior Night package (including: black door sills; steering wheel gear shift panels in black; black inserts below head restraints; black strut in the luggage compartment); sports tyres; and AMG performance steering wheel in black Dinamica microfibre. 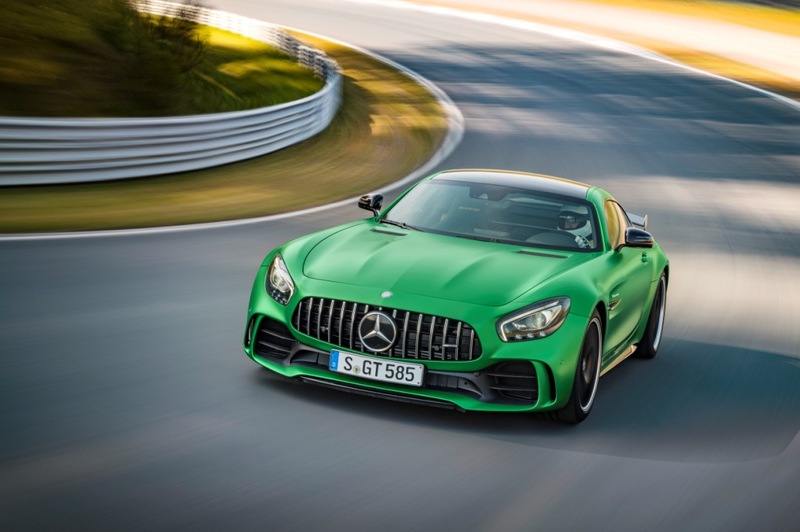 The Premium package is also available on the AMG GT R – for £4,195 – with the addition of heated seats. The AMG Track package costs £1,685 and adds four point seat belt harnesses; a fire extinguisher; and a roll cage. Carbon ceramic brakes can be added for £5,995. For £595, customers can add the Lane Tracking package which includes Blind Spot Assist and Lane Keeping Assist. Alternatively, for £1,695, the Driving Assistance package adds Distronic Plus and the Pre-Safe system – in addition to the contents of the Lane Tracking package. 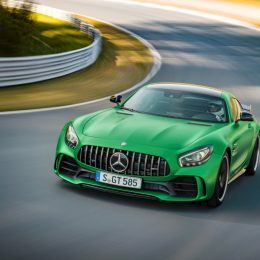 The AMG green hell magno paint – as seen from the car’s launch – is a £7,500 option. Yellow seat belts are also optionally available for £395. The AMG Carbon Fibre package costs £3,895 and adds exterior styling details with a carbon fibre finish. The AMG Matt Black Carbon Fibre Trim package costs £2,995 and adds carbon fibre detailing to the interior trim. For full details including prices and specification, visit www.Mercedes-Benz.co.uk.